Twelve species of monogeneans of the family Microcotylidae and one species of the family Heteraxinidae were collected from fishes of the Swan River Estuary and adjacent coastal marine embayments near Perth in Western Australia. The genera represented were: Microcotyle (four species), Solostamenides (one species), Diplasiocotyle (two species), Polylabris (five species) and Gonoplasius (one species). Microcotyle pomatomi Goto from Pomatomus saltator (Pomatomidae) is proposed as a senior synonym of M. australiensis MacCallum, M. debueni Mañé-Garzón and M. temnodontis Sandars from the same host. M. helotes Sandars, reported from the teraponid fishes Pelates sexlineatus (type-host) and Pelsartia humeralis (new record), is redescribed and illustrated. Microcotyle arripis Sandars from Arripis georgianus (Arripidae) is briefly redescribed and illustrated, and a single specimen of Microcotyle sp. from Sillaginodes punctatus (Sillaginidae) is reported. Solostamenides pseudomugilis (Hargis) from Mugil cephalus (Mugilidae) is redescribed and illustrated, and compared to S. mugilis from the same host. Recent reports and the affinities of Diplasiocotyle johnstoni Sandars and D. agonostomi (Sandars) from Aldrichetta forsteri (Mugilidae) are briefly discussed. The affinities of the genus Polylabris to the subfamily Prostatomicrocotylinae and the doubtful validity of the subfamily Polylabrinae are discussed. 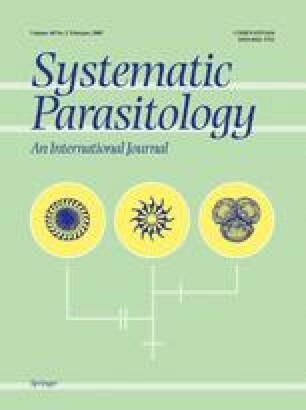 Polylabris sillaginae (Woolcock), a new record from Sillago schomburgkii (Sillaginidae), is redescribed and proposed as a senior synonym of P. parasillaginae (Sandars). Polylabris sandarsae n. sp. is described from Sillago maculata (Sillaginidae) as a new species based on the character combination of paired vaginal pores, 6–10 large testes and the haptor clearly overlapping the testicular field. Brief descriptions and illustrations of two unidentified species of Polylabris from the sillaginid fishes Sillaginodes punctatus and Sillago bassensis are included. They differ from previously described species in the low number, small size and distribution of the testes. A brief discussion is given of Polylabris gerres from Gerres subfasciatus (Gerridae). The heteraxinid Gonoplasius carangis from Pseudocaranx dentex (Carangidae) is redescribed and illustrated, detailing hamuli and marginal hooks for the first time. Specimens of all the above species are lodged in the British Museum (Natural History) Collection.